In this article we’ll cover how to care for orchids – focusing specifically on the Phalaenopsis orchid. Soon you’ll see that Phalaenopsis orchid care isn’t terribly difficult, once you know the basics – and because of a few unique characteristics of this highly popular orchid variety (as you’ll discover in a moment). First, a few important things that you should know. Phalaenopsis (“fayl-eh-NOP-siss) orchids are often referred to as the “moth orchid” due to their flowers’ supposedly resembling the flying insect. The growing environment of the Phalaenopsis orchid is comfortable for humans, and for this reason, they are the most popular type of household orchid. Another reason they are so popular is because they have the ability to bloom for months at a time and also can also rebloom! Phalaenopsis blooms come in a wide range of shapes, sizes, and colors. Phalaenopsis roots must grow in damp conditions so it is important to never let the roots dry out, however, it is also important to make sure that the roots don’t sit in standing water because this can lead to the roots rotting. Watering frequency – as covered in this article about watering orchids – can be determined by a few different things. One factor to consider is the time of year. While the orchid is in active growth, during the warmer months, you will want to water more frequently (generally every day or every other day), and less frequently (generally about every 7-10 days) in the cooler months. A Phalaenopsis orchid should be watered in the morning using tepid water. This will give the orchid adequate time to dry before the lower night temperature sets in. Remember, is very important to not let the Phalaenopsis’ roots dry out completely. As covered in this article about orchids care and light, Phalaenopsis orchids need low light intensity in order to thrive. If your Phalaenopsis orchid is receiving too much light, the leaves will become a yellow-green color and could possibly develop a red-tint around the leaves edges, and too little light will cause the leaves to become a very dark green color. The best place to grow you Phalaenopsis orchid indoors in on an east facing windowsill, although a shaded south facing window will also work. 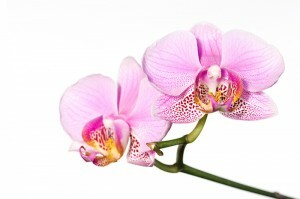 It is important to not let your Phalaenopsis orchid get direct sunlight because this could cause sunburn to the plant. As discussed in this orchid plant care article on temperature, the ideal daytime temperatures to grow your Phalaenopsis orchid is between 70°F to 80°F (21.1°C to 26.6°C), and night temperatures should be about 65°F (18.3°C). Phalaenopsis orchids are able to sustain temperatures between to 85°F to 95°F (29.4°C 35°C ), although they will need more frequent watering in order to ensure that they do not completely dry out. In order to help encourage the growth of flower spikes, the temperature should be dropped to 55°F (12.8°C) few a few weeks in the fall. If your Phalaenopsis orchid becomes too hot or too cold this could damage the flowers and lead to bud blast which is when the flower buds fall off before they are able to open and be enjoyed. As covered in this “humidity” article on how to care for orchids, Phalaenopsis orchids thrive in humidity levels of at least 50 percent or higher. The humidity level can be easily increased in your orchids growing area by placing your orchid on a humidity tray. These are found in orchid specialty stores and sometimes also in home improvement stores. You can easily create your own by setting the orchid’s pot on top of a tray filled with water and pebbles. Remember, it is important that your orchid’s roots do not directly sit in the water. When you have high humidity levels, it is equally important to maintain proper air movement to prevent orchid disease from developing. You can increase air movement for your orchid by placing an oscillating fan nearby. Phalaenopsis orchids should be fertilized regularly (generally once a month). Remember to only fertilize your orchid when the potting medium is damp. Never fertilize a dry orchid because this can cause major root damage. It is important to flush out any excess fertilizer (once a month) so that the excess build-up of salt does not do damage to the plant’s roots or leaves. Phalaenopsis orchids should be repotted once every one to three years or once the potting medium remains soggy and no longer drains properly. You will want to repot during the spring after the orchids flowers have bloomed. Before repotting your orchid, you should trim away any damaged or rotting roots with a sterile cutting tool. Phalaenopsis orchids tend to do very well in plastic pots since they can retain moisture for longer than clay pots. #1 – More Free Phal Tips! If you’d like to learn everything you need to know about phalaenopsis orchid care, we also have something called the Phalaenopsis Master Class. This is hands-down the most comprehensive program covering everything you need to know specifically about phals, including all the advanced topics. The course contains dozens of videos, checklists, step-by-step tutorials complete with detailed full-color photos (including a handy month-by-month care guide and troubleshooting section). In fact, if you’d like you can check out the entire table of contents by clicking on that link. The master class is delivered in an online members area – which you can access 24/7 365 days a year with a username and password you’ll be given after signing up. And because the course is backed by a full 100% money-back guarantee, if after checking it out you decide that it’s not for you or that you didn’t get value you out of what you learned – no problem! Simply send us an email to let me know, and you’ll receive a fast and courteous refund. Put it this way: If you’re not happy, I’m not happy!